The requirement for all new-build homes to be built to a zero carbon standard by 2016 is beginning to look distinctly unrealistic. Not least because the government itself has not even managed to agree what zero carbon actually means. In this report we consider the wider picture by examining the policy background, implications for developers and the market, and even the future of energy distribution. The shift to zero carbon has huge implications for housing market affordability, land market economics and politics. In our Green Homes Survey, featured on page 5, we point to a potential 22% uplift in build costs. With buyers already struggling to afford homes, at their current prices we examine what needs to give to accommodate these increased costs. Britain, now a net importer of energy, faces a need to make substantial investment in energy infrastructure. At the same time, when budget cuts make this investment appear all but impossible. Current estimates suggest that decarbonising the national grid and creating the kind of renewable energy industry enjoyed in Europe in such a short space of time is not going to be possible. The coalition government’s localism agenda is set to hand greater powers to communities. It will be interesting to see which communities will agree to have renewable energy plants located on their doorstep in order to meet the government’s ambitions. In addition to assessing the main challenges and opportunities for the house-building sector from zero carbon legislation, we have also provided a series of practical observations and recommendations for what needs to happen if the UK has any hope of complying with its commitments. In December 2006 the then Labour government proposed in ‘Building a Greener Future’ that all new homes would be constructed to a ‘zero carbon’ standard by 2016. Alongside this proposal, the government also issued the ‘Code for Sustainable Homes’ which provided a set of voluntary energy, carbon and sustainability standards for new homes. Aspirations for new zero carbon non-domestic buildings by 2019 were outlined in the 2008 Budget. The new coalition government has brought with it a range of new policy objectives, but the pledge to ensure that all newly built homes are zero carbon by 2016 has been retained. Although this target has been well reported, the underlying detail, particularly concerning construction, renewable energy and required changes to the planning system, is both complex and confusing. As far as the construction sector and environmental legislation are concerned, it is at a European, rather than at a national level, where the real power lies. The EU’s Energy Performance in Buildings Directive (EPBD) ultimately determines the UK Government’s room for manoeuvre in this area. The EPBD Recast – an updated version of the original directive – was published in June 2010 and it will be this document that the new coalition government will have to adhere to. The biggest revelation provided by a study of the EPBD is that there is not a single mention of the phrase ‘zero carbon’. The directive goes into detail about ‘zero energy’ buildings but with one vital caveat: the inclusion of the word ‘nearly’. There are three important points to note here. Firstly, the definition of zero carbon does not need to be nearly as prescriptive as has been attempted by the previous Labour government and the current coalition government, secondly the deadline for compliance is 2020, not 2016, and finally while the EU is setting out the targets, the UK government will have full control over the path we take to get there and the incentives and measures we use to make it happen. Building Regulations will be tightened this month (October 2010) and then again in three years’ time, as part of a plan to spell out properly what the boundaries for delivering zero carbon homes are. Part L of the Building Regulations currently does this but obviously does not cater for the newest targets. We expect to see greater legislative attention being paid to higher standards of fabric efficiency. While the zero carbon definition looks primarily at the energy uses within a building, clearly the materials used to construct a building play a huge role in determining how energy efficient it will be. Despite all the work which has gone into developing the UK’s Code for Sustainable Homes, there is still a critical missing link – namely a firm definition of “zero carbon”. Until a definition is confirmed, consulted upon and agreed, there will be considerable difficulty for the house-building industry to plan for the 2016 deadline. One of the main efforts being made by the government to achieve zero carbon development is to radically reduce carbon emissions by the generation of renewable energy within new developments. This process of providing for low-carbon districts or decentralised energy supplies will have important implications in the UK. The process of decarbonising the grid will involve a huge shift from high carbon power generation sources to low carbon ones. At the same time we must see a substantial shift towards energy generation infrastructure that is much closer to the point of use. We will effectively move away from our post-war centralised grid system built around relatively few very large coal-fired power stations, with high transmission losses and high carbon technologies, to smaller scale, localised, low carbon infrastructure. However, without a national renewable strategy, or any firm plans for how to decarbonise the grid, Britain is years behind Scandinavia and other parts of Europe. This means that the infrastructure development necessary to make zero carbon homes a reality just does not currently exist on the scale necessary. So we are looking at a dual approach. One where longer-term infrastructure development focuses on large-scale off-shore wind and nuclear energy that is fed into the grid. These investments can then work alongside decentralised energy projects, such as solar, biomass, ground and air source heat pumps, waste-to-energy and other biofuels with a much shorter lead-in time. The scale of investment needed for decentralised energy projects will be significant, and it will not be met solely by developers. Innovative financial models will be required if the funding for off-site and near-site zero carbon energy solutions is to be secured. The essential factors in the viability of local or district energy infrastructure projects are their scale and security of market. Small-scale projects serving a few hundred homes are too costly to be viable and lack the critical mass to be effective, but finding ways to integrate new low carbon energy infrastructure into existing residential areas could be an economically sensible way of providing utilities for new developments and connecting to older building stock. It is important to remember that 80% of the buildings that will exist in 20 years time (and consuming energy) are already built. Given that finance for decentralised energy projects, particularly with capital expenditure under £50 million, is still very difficult to secure, and that land values are unlikely to bounce back from current levels rapidly, there is unlikely to be a significant increase in lending from traditional sources. The lack of firm guidance on the zero carbon definition, does at least offer the potential for an industry-wide debate on how the government’s ambitions are likely to be met. Our view is that the cornerstone of future zero carbon delivery will need to be based on a hierarchy of actions, which deal with energy efficiency first, before provision is made for the reduced remaining energy need. In our three-step hierarchy, described below, steps one and two should account for around 70% of the required saving in energy use, with the final 30% coming from step three. 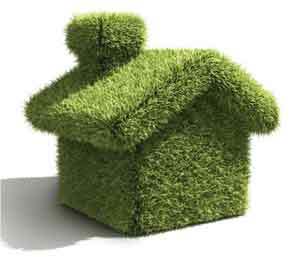 The fabric of new homes should meet strict levels of energy efficiency. To be responsive to varying proportions of external wall, ‘passivhaus’ standards are proposed: 39 kWh/m²/yr for apartment blocks and mid terrace houses and 46 kWh/m²/yr for semi-detached, end-of-terrace and detached houses. New developments will need to include on-site renewable energy generation, such as solar, biomass, waste-to-energy or other biofuel as well as heat from directly connected sources. The remaining emissions reduction will need to be achieved through a range of ‘allowable solutions’ – a variety of measures that will vary dependent on the size and location of the development. There will be an agreed cap to their cost that will be related to the comparative carbon cost in achieving the same level of carbon reduction through direct investment. It is this area in particular where greater clarity is urgently needed. How will allowable solutions be priced? What carbon projects will be prioritised? How will it be integrated into the planning system? Who will administer these large allowable solutions funds? A fundamental question is how local planning authorities will be guided to interpret the acceptable routes to meeting zero carbon. Clearly, limiting a developer’s options to on-site solutions is not viable for all sites. Therefore, we believe that a clear system will have to be developed to allow developers to use near-site and off-site solutions. Bureaucratic and prescriptive decrees over technologies – through enforced rules spearheaded by Merton Council in south London – have undermined the wider objectives of reducing emissions. The so-called ‘Merton Rule’ earned notoriety by demanding that 10% (and now often 20%) of energy for new developments was produced through on-site renewable technology. While pioneering at its time, the goal of pushing developers to put more and more renewables on-site is a blind alley. The most important priority must be to achieve the largest possible carbon reduction in the most cost-efficient manner. The best bang for the developer’s buck in carbon terms. In our view, the hierarchy approach outlined above should be followed so that developers know the costs involved at each stage and the routes open to them to achieve zero carbon development. For zero carbon homes to be a reality, the developer must be left to make the right decision for their project. This will include initially building to very high fabric efficiency standards (with an associated increase in construction costs). Based on their site boundary, location and loadings, developers will then need to decide what renewables provision is cost effective on site. Finally, developers will need to pay into an allowable-solutions fund for specific carbon-abatement projects at a reasonable price that will not make the entire development unviable. This approach will provide the developer with the flexibility to meet the zero carbon definition with certainty and economic sense. Building to ‘passivhaus’ standards will cost more, but this is a surmountable task with improvements in construction efficiencies and much greater pre-fabrication. On-site renewable feasibility assessments are now commonplace and will not require greater cost or complexity than is currently the case. However, the viability of renewables investments on-site will be drastically undermined if feed-in tariffs are diluted or scrapped. What price per tonne of carbon abated will be used? Will this rise and fall with the traded price of carbon or with the cost per tonne of carbon abatement projects, using a basket of technology options? Who will administer the payments to the fund? Who will administer the expenditure of allowable solutions capital on carbon abatement projects? What projects will be prioritised? Who will audit this process? The ideal outcome for the industry, which we believe will lead to early industry preparation, would be to set minimum fabric efficiency standards based on work by organisations like the Zero Carbon Hub, and utilise a flexible approach to meeting zero carbon targets based on the carbon saving achieved through the most efficient method. This flexibility should allow for different solutions to be chosen for different sites and a range of technologies to be employed. The common denominator in all of these cases must be the price per tonne of carbon abated. This will be the factor that a developer will use when examining whether on-site, near-site (connected), off-site or allowable solutions works best for them and their project. Setting this price, just as determining the zero carbon definition to be used, requires government leadership. Given the delays we have seen to date, we can only hope that greater clarity and speed of determination are shown soon. The hope has to be that we can create a market-driven model as a mechanism for meeting our zero carbon targets. With this model in place we would expect that competition and innovation will follow, driving down costs and raising efficiencies. The results of Knight Frank’s 2010 Green Homes Survey* provide a clear warning to the policymakers who asked the industry to prepare for a ‘zero carbon’ future without clearly defining the requirements. The results of our survey into the impact of zero carbon requirements on the housebuilding industry confirm a general disappointment with the lack of policy direction provided over the past few years. These are coupled with a more worrying concern over the impact of the zero carbon homes agenda on the ability of the sector to raise development volumes. This negative impact on development volumes would seem to be a critical failure. In figure 1, over 40% of respondents said they believed that the absence of a firm definition of zero carbon had reduced development volumes, over and above the reduction attributed to the impact of the credit crunch and recession. Perhaps more concerning is the fact that over 80% of respondents believed that the ambition for mandatory zero carbon residential development from 2016 is not compatible with a significant growth in development volumes (figure 2). The new coalition government is at least attempting to consider methods of reducing the impact of zero carbon requirements on more difficult sites, particularly urban ones. This includes the potential introduction of ‘allowable solutions’, which would require a local and highly-defined carbon abatement payment to be made for dealing with residual carbon emissions off-site. There is still a degree of industry scepticism around these efforts (figure 3). Despite the very real industry concerns identified in our survey results, it would be unfair to suggest that there is a general lack of engagement from housebuilders and developers. Figure 4 shows some very clear evidence of positive steps being taken by our respondents to prepare for zero carbon status. Over 70% had either implemented, or were planning to implement, solar on-site renewable energy generation. Many of our respondents were using or planning to use ‘passivhaus’ standard insulation and thermal efficiency (62%), biomass on-site renewable energy (44%) and district heating/cooling systems (39%). This points to a potential success story – the industry is willing to invest in and innovate green technologies. The question would appear to be: is the policy framework enhancing or detracting from these moves from the private sector? The requirement for developers to shift from Code Level 4 to Code Level 6 by 2016 is likely to have considerable implications for the housing market, the development land market and the experience of the new-homebuying public. Our respondents believed that build costs will rise 22% (figure 6). Some of this increase in costs could be offset by a sale value premium attaching itself to a Code Level 6 home. There was a feeling that this premium was limited (figure 7), but that it could increase marginally, post 2016, as consumers become more educated about the implications of zero carbon on running costs (figure 10). In terms of future housing affordability, consumer satisfaction and the willingness of landowners to bring land forward for development, the results in figure 10 fail to reassure. Respondents expected land values to fall, sale prices to rise and quality and specification to decline. The conclusion from this year’s survey is that the new government has some way to go to explain how the 2016 zero carbon commitment will impact on the ability of the industry to deliver increased development volumes, as well as the potential impact on pricing and market affordability. There is some very interesting work being undertaken on trailing and implementing low carbon energy generation, which indicates that the industry is ready and willing to engage. The government must now provide clarity on definitions to allow for more careful planning and preparation from the sector over the next five years. *The Knight Frank Green Homes Survey was undertaken in September 2010 and the results reflect the views of 142 senior house-building representatives including managing directors, CEO’s, directors and managers, all of whom are involved in the house-building process. Knight Frank Residential Research provides strategic advice, consultancy services and forecasting to a wide range of clients worldwide including developers, investors, funding organisations, corporate institutions and the public sector. All our clients recognise the need for expert independent advice customised to their specific needs. This report is published for general information only and not to be relied upon in any way. Although high standards have been used in the preparation of the information, analysis, views and projections presented in this report, no responsibility or liability whatsoever can be accepted by Knight Frank LLP for any loss or damage resultant from any use of, reliance on or reference to the contents of this document. As a general report, this material does not necessarily represent the view of Knight Frank LLP in relation to particular properties or projects. Reproduction of this report in whole or in part is not allowed without prior written approval of Knight Frank to the form and content within which it appears. Knight Frank LLP is a limited liability partnership registered in England with registered number OC305934. Our registered office is 55 Baker Street, London, W1U 8AN, where you may look at a list of members’ names.